The premiere chemistry student workbooks tied to the British Columbia science curriculum. 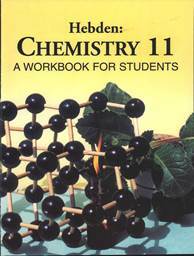 Many BC science teachers were students when they first used Hebden Chemistry Student Workbooks. It’s not surprising that they recommend the same books to their students. The Jim Hebden Chemistry Bursary will be awarded to a student who has performed service for his/her school and/or community while maintaining the grades in science that are necessary for success in post-secondary education. This year, the bursary will be raised to $1000. 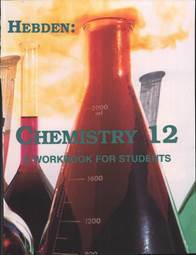 The $1000 bursary, to be used for post-secondary studies, is presented annually by Western Campus Resources, the exclusive distributor of the best-selling Hebden Chemistry Workbooks 11 & 12. Western Campus Resources received many applications for the Hebden 2018 Chemistry Bursary and would like to thank all of the students who submitted applications. We also appreciate and thank the teachers who took the time to write letters of support for their students. While many winners apply, there can (unfortunately) only be one recipient. Jim Hebden and Western Campus Resources are pleased to award the 2018 Hebden Chemistry Bursary to Sarah Kedves of South Island Distance Education School in Saanich. Ms. Kedves will commence studies toward a science degree in Kinesiology at the University of Victoria and then go on to either medical school, pharmacy or physiotherapy, with the goal of becoming a Team Doctor. Ms. Kedves is a multi-talented woman. She is a national level figure skater, a provincial level track & field athlete, coaches Special Olympics Track & Field and maintains a 92% GPA. Her sponsoring teacher, Mr. Clint Surry, says “The determination, work ethic and perseverance that helps her (Sarah) succeed as a high-level athlete complement her well with completing her academics”. The Hebden Chemistry Bursary is awarded annually to a graduating student who demonstrated an above-average proficiency in chemistry, distinguished her or himself serving her or his community and has the potential to succeed in the study of chemistry at a post-secondary level.